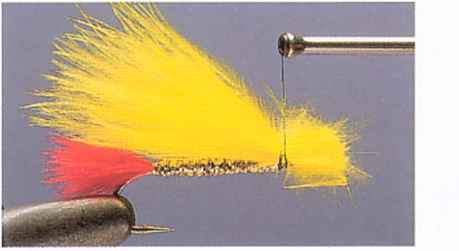 While this yellow and gold version of the Marabou Muddler works extremely well, the pattern can also be tied in a wide range of colors. In white and silver it makes a great imitation of a silvery bait fish, while in olive or brown it can be used to suggest anything from a leech to a small bottom-dwelling fish. In all its variations, the basic techniques and materials remain the same. Its pulsating, fish-attracting action comes from a generous wing of turkey marabou while the bulky deer hair head makes plenty of subsurface disturbance on the retrieve. The pattern can be fished at all depths, but on those variations designed to work close to the lake or riverbed, a weighted underbody is used. 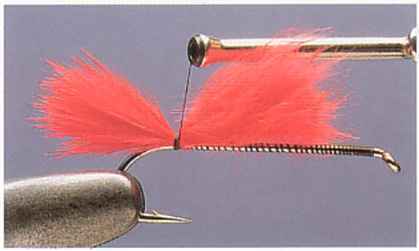 1 Secure the hook in the vise and run the tying thread down the shank to the bend. There, catch in a tuft of dyed red marabou for the tail. 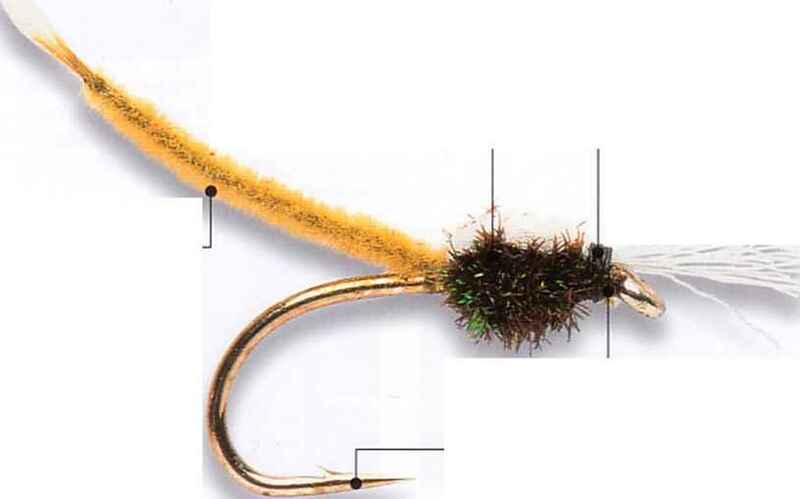 Allow the waste ends of the marabou to lie along the hook shank. 2 Wind open turns of thread over the waste ends of marabou to form an even base for the body. 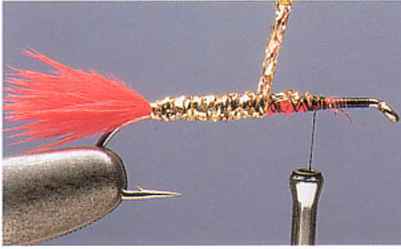 Catch in 4 inches (10cm) of gold tinsel at the base of the tail, again using the waste end to create an even base over which to wind the body. 3 Take hold of the gold tinsel and begin to wind it along the shank. Make sure that each turn overlaps slightly—this helps to create an even effect. Carry the tinsel toward the eye until it covers three-quarters of the hook shank. 4 Secure the loose end of the tinsel and remove the excess. 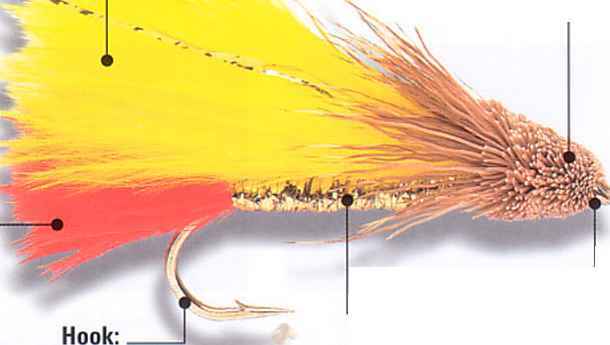 Next, take a generous plume of dyed yellow marabou and catch it in place just in front of the body with tight thread turns. Make sure that the wing tip is level with that of the tail. 5 Add a few fibers of gold or pearl Flashabou over the top of the wing. 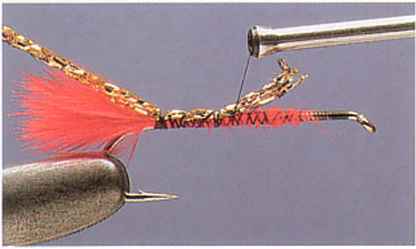 Then offer a bunch of deer hair up to the hook so that the tips project back over the wing. Wind three turns of thread over the hair pulling it tight so that the hair flares. 6 As the deer hair flares and spins around the hook, the tips will form the collar. Secure the hair with tight thread wraps, adding further bunches until the gap up to the eye is filled. Cast off the thread and trim the hair to a neat bullet shape. Can deer hair be used as marabou?